Steven James is a bestselling author and multiple award-winner, as well as a contributing editor at Writer’s Digest. In his new novel, Singularity, the second book in The Jevin Banks Experience, author James asks the question: “What would you be willing to do to live forever?” That line sets the hook that catches readers and pulls them aboard a ship headed toward treacherous waters. Aside from the sometimes complex explanations of medical and technological terms and procedures, the story is intriguing and downright scary. While it is at times difficult to absorb, the science that Mr. James includes in his story lends the credibility needed to make the story believable. The book’s protagonist, illusionist Jevin Banks, finds himself drawn into a web of deceit and conspiratorial mystery as the book opens in a jungle in Indonesia. Banks’ cherished friend is murdered during a death defying illusion gone bad. Banks is crestfallen. “It’s only wishful thinking to say that love conquers all. It doesn’t. Death does. In the end, death even conquers love.” Powerful writing. Complete with poisonous snakes, and an exciting foot chase through the thick, dense vegetation, the story eventually leads back to the States where a diabolical antagonist is manipulating everyone—including the government. The premise of Singularity is manipulation of the brain so that man and machine become one. To that end, some horrible and macabre experiments take place that are frightening enough to produce nightmares. 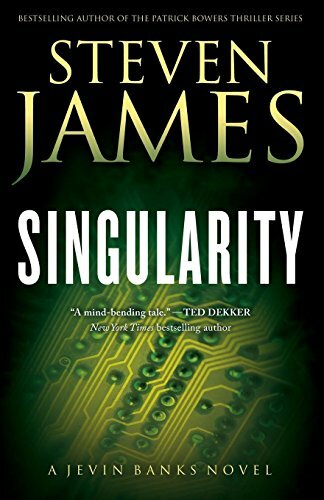 The story is well researched, a hallmark of Steven James’ novels, and by the time it reaches its climax, one may wonder if Singularity is fact or fiction.